There is something satisfying and, well, just plain fun about making candy at home. While delving into the world of candy making can be intimidating, a great place to start is by candying citrus peel, because the ingredients are prolific and the time needed to make this treat is relatively short. 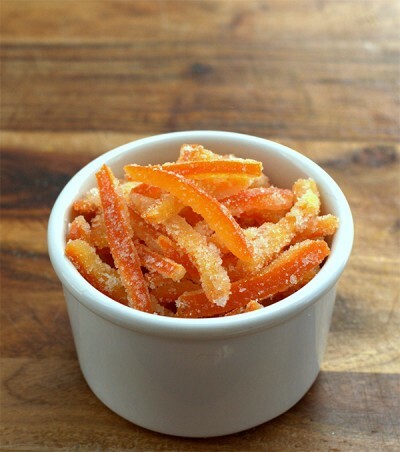 Recipes for candied citrus peel vary as widely as the range of the human palate. How do you pick which one to follow? My suggestion: Don’t follow a recipe and instead understand the process. Below, I outline the primary steps to candy any type of citrus peel, including the rationale behind the method and tips to make the venture go smoothly. Don’t let all the options overwhelm you – the information is only to empower you to make thecandy exactly as you envision. Get your hands on some citrus peel. The following steps apply to any type of citrus, so pick your favorite – lemons, limes, oranges, tangerines, grapefruit, and so forth. If you eat oranges or another kind of citrus regularly, you can save the peels in a container in the fridge over the course of a week. 1. Prep the peel. How you prepare the peel for candying depends on both how you plan to ultimately use it and personal taste. First, you have to decide how much of the pith to keep; the pith has more bitterness (which can also be addressed in Step 2) and can take longer to prepare, but it also has a lot of flavor. Either leave the peel intact, use a paring knife to slice off some of the pith, or use a vegetable peeler to just get the very outside peel. Second, cut the peel into whatever shape you prefer. Strips are common but go as artistic or rustic as you’d like. I like to maintain all of the pith and cut the peel into wide strips. 2. Boil the peel…or don’t. Boiling removes bitterness but also some of the flavor. Since much of the bitterness resides in the pith, take into consideration which method you used in Step 1. I prefer an intense citrus flavor, so if I have removed much of the pith or the skins are naturally slender (as with tangerines), I skip boiling altogether; for a thick peel I will boil once. Cover the peel with cold water and bring just to a boil, then drain. 3. Cook the peel in sugar syrup. Many recipes call for a simple syrup made of a 1:1 sugar to water ratio, but I recommend using 50% more sugar for candying citrus. Use as much water as needed to just cover the peel – I’ve used as little as ½ cup water and ¾ cup sugar when cooking peels from two tangerines. Bring the water and sugar mixture to a boil until the sugar has dissolved before reducing to a bare simmer and adding the peel. Cook the peel until it just beings to turn translucent, which can take as little as 30 minutes to as long as an hour.Strain the peel but keep the flavored syrup to add to cocktails, dressings and tea or to brush on cakes. 4. Toss in granulated sugar…or don’t. If you’ll be chopping up the peel to add to a baked good, the extra sugar is superfluous. However, if the peel will be used as a garnish or snack unto itself, the sugar adds a pleasant crunch and a pretty sparkle. Tip: Use two forks to toss the peel and avoid a sticky mess. That’s it! Spread the peel on a cooling rack for two hours or until dry, and store in an airtight container for a week on the counter or month in the fridge. Feel accomplished for having made your own candy at home. My favorite way to use candied citrus is to stuff puff pastry with a mixture of fresh ricotta and finely chopped candied tangerine. 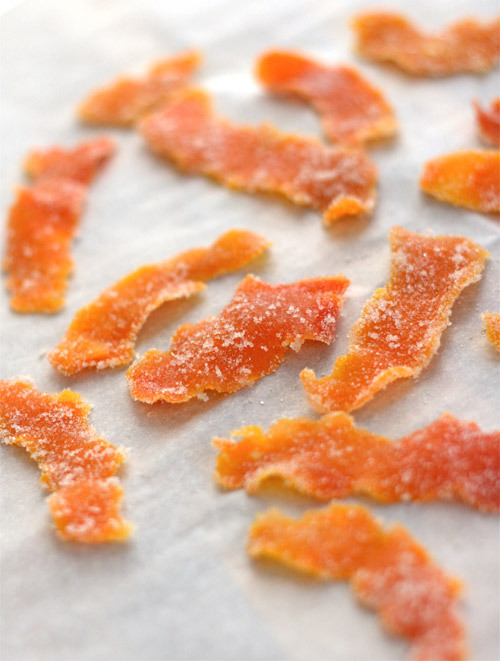 How do you use candied citrus peel? Mmm, I will have to give this a try. The pictures look so good that I can almost taste them!